Dragon's Trail by Joseph Malik. Oxblood Books, 2016. Ebook. 396 pages. If you're looking for some high quality fantasy (or fiction in general) by an indie author, then put your brakes on and have a seat, because you have reached your destination. 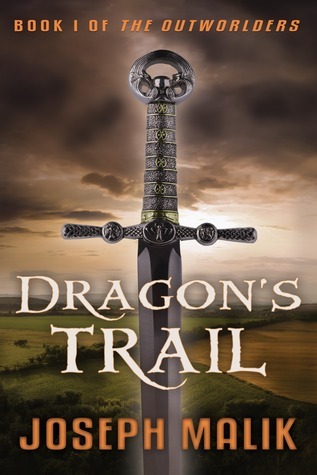 Joseph Malik combines masterful prose and an intricate, exciting fantasy plot to create an incredible first book in Dragon's Trail. This hard fantasy, written with great attention paid to every last detail. Malik's writing is both effortless and finely written. The world-building is extremely well done and so realistic that I was able to easily fall into this world and enjoy every minute. The story begins when Jarrod, one of the world's best fencers, is taken to another and asked to participate in their war. Before we move onto more details about the rest of this book, I'd like to take a brief moment to discuss this other world. I was fascinated by this world, which seems to be medieval-inspired, but also wholly its own. It's brilliantly gripping and fits in perfectly with other classic fantasy books that explore worlds outside of the earth. There is quite a bit of exposition in the beginning of this book, but it is done in a way that makes you want to keep reading. We, the readers, learn about this otherworld just as Jarrod learns about it; when he wakes up confused and uncertain in an unknown place, we have those same questions, which allows us to learn at the same pace as Jarrod. Jarrod is an endearing character, and this includes both his strengths and his faults. I loved how ready for adventure he was throughout this entire book. Of course he complained about conditions or events he wasn't thrilled about, but he just kept going. He's humorous and seems easily underestimated, but in only a moment's time he can delve into his deep knowledge and fighting skill, a duality that I truly appreciated in Malik's writing. Action scenes are available in abundance throughout this book, so if that's something you love you you should pick this up right away. Not only is the action exciting, it is also original and carefully thought out to make it as authentic as possible. Now, I'm no expert on swordplay or any of the like, but I truly believe in Malik's knowledge and understanding of this subject, as he himself has skill in these areas. Overall, I am giving Dragon's Trail four wonderful stars!